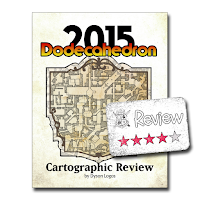 I'm one of probably a couple hundred folks who picked up Dyson Logos' 2015 Dodecahedron Cartographic Review (say that five times real fast!) 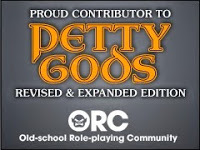 when it was a Deal of the Day over at DriveThruRPG. Now I already have most, but not all, of these maps already because I check-in on Dyson's Blog almost religiously. Generally speaking I'm not a big fan of paying for something I already have for free, but I did for a couple of reasons.....none of which really matter for the sake of this review. Right off, I'm quite pleased on how Dyson organized this download. Instead of one absurdly locked-down and watermarked PDF, Dyson presented this as a ZIP file containing three PDFs. The first is the "main" file containing all 87 maps with a write-up for each. Basically this one PDF is what you'd get from reading each blog entry and the maps. The second file is the cover for the printed booklet...should you choose to print it out as a booklet. The remaining file is the collection of maps without the flavor text. Basically you can print out the booklet as you wish. If you wanted to import the PDF pages into the likes of Photoshop to tweak things for personal use...you can as Dyson didn't add any PDF security. Personally I like to print out mini-booklets of the maps and usually I have to do a lot of back-door tinkering to get it done. Not this time! Now I do think Dyson missed some real opportunities here with these PDFs and together I have to drop the overall rating a star. First off, there are no bookmarks in the PDFs. Want to jump to a specific map? Sorry, but you'll have to thumb through the 88 pages until you find the map you want. If you look through the PDF properties there is nothing....nada...zip...zilch. Now most PDF publishers ignore the PDF properties, but it is an ideal place to put things like your copyright notice. Also, there isn't a single hotlink in the PDF and the single largest lost opportunity would be a link (or links) to Dyson's blog or Patreon site. All of the maps I've checked in on between these PDFs and the maps available on the blog, the blog maps were larger (same 300 dpi), but not by much. If I wanted a particular map I'd probably be better off downloading it instead of importing from the PDF. In this case I'd pay good money just to be able to use the PDF as a guide to the map online at the blog. If I was a stranger to these maps, I might want to check out the Patreon site and contribute there. In either case a hotlink or three would have been most useful. I also found a spelling error that InDesign (what Dyson used to create the PDFs) should have caught if a spelling check was done. I wasn't looking for errors, this one just jumped out at me. Of course all these things don't really detract from the awesome maps, they are just things that could have pushed the overall product into one of the best I've ever downloaded. I also have to give some mad props for Dyson formatting these PDFs as Letter-sized instead of A4. I know we are still way behind the times here in the US, but the paper that is easy for me to get is Letter, not A4. Not having to tweak the printing is a good thing, at least for me.